After first watching the trailer for Joy, I had little idea of what the film was about, except that it starred Jennifer Lawrence as Joy—a strong, successful woman who, at some point, cuts her hair. And since its release, the debate as to what this film is really about has not settled, with reviewers each focusing on one aspect the film touches on: family dynamics, feminism, commercialisation, etc. without any majority consensus. Inspired by the life of Joy Mangano, Joy is about the struggle of a divorced mother of two and airline reservations specialist who gets the idea for the Miracle Mop, a mop which does not need to be wrung by hand. The mop itself has been enough to turn people off the film. With our current cultural climate producing films like The Wolf of Wall Street and The Big Short, movies than centre around men making high-risk, high-reward, and ethically questionable decisions in the stock market, a film about a fortune achieved by the invention of a new mop by a young woman in a stained blouse could be seen as banal. It is certainly much less flashy, and involves far more longevity, perseverance, and not even one exotic dancer. 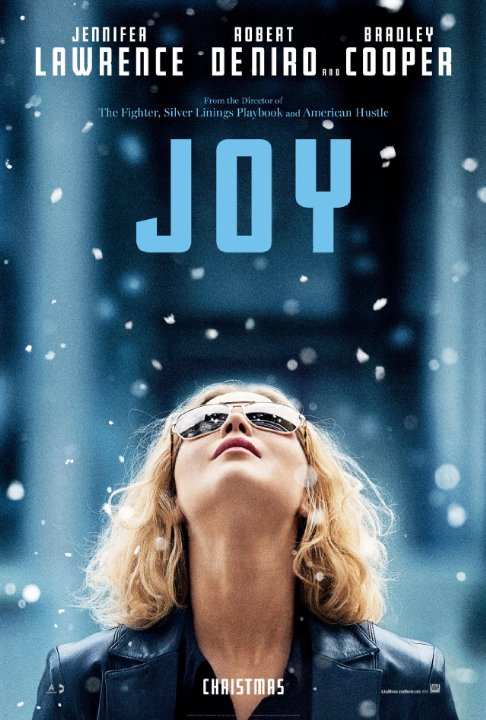 For Joy to be successful, she has to continuously overcome certain challenges involving financing, manufacturing, corrupt businessmen, and her emotionally and financially dependent family. Her biggest supporters are her grandmother, Mimi (Diane Ladd), ex-husband, Tony (Édgar Ramirez), and best friend, Jackie (Dascha Polanco), while her father Rudy (Robert De Niro) and half-sister Peggy (Elisabeth Röhm) are more invested in their own interests, and are willing to sacrifice Joy’s success for their own. Peggy, from the get-go, is jealous of her sister, frequently insisting that her own inventions would be better for business, while Rudy seems more interested in his romantic relationship with Joy’s investor, Trudy (Isabella Rossellini), than in supporting his daughter, and consistently sides with Trudy in business disputes. Over the course of the film, Joy changes from being the silent doormat of her family into someone who stands up for herself and her own interests. As a role model – both as a woman and as an entrepreneur – Joy is an inspiring character. She is firm and persistent, standing up to men and women with more power and respect than her, and as a result earning power and respect. There are any number of times when Joy is scared or lacks confidence (from pitching her product, to her first time selling the Miracle Mop on television) but she is able to summon up a false confidence that allows her to succeed. Joy’s character is the epitome of that old saying that bravery is being scared but doing it anyway, even if in this case “it” is selling a mop. And yet, there is something off about Joy. Narrator and grandmother, Mimi, believes in Joy’s success more than anyone, but it isn’t because of any of the aforementioned qualities listed. Rather, it is because of destiny, and Joy’s innate skill, that she can “have it all” – a husband, children, and a successful career as an inventor. Ignoring the fact that not all little girls grow up wanting to be wives and mothers, what bothers me about Mimi’s belief in Joy is that it is based on what she is born into, rather than what she achieves throughout the film. It is not the traditional narrative of birth rights; of baby boys destined to be king, or CEO of the family business; but it is an idea that is so antithetical to the amount of effort and work from Joy that went into her success. Confidence and power are clearly not what she is born with, and yet through her persistence she manages to attain these things. I am reminded of the foreword written by Hayao Miyazaki in the art book, The Art of Miyazaki’s Spirited Away. When Miyazaki talks about his inspiration for the main character of Spirited Away, Chihiro, he states that ‘[s]he is a heroine not because she is beautiful or because she possesses a unique mind’, but because she is ‘strong enough not to be eaten up’ by crisis. Joy is, by our cultural standards, beautiful, and she has a unique mind, but this is not what makes her successful. To credit her success to destiny, or on her inherited qualities, teaches young women (and men) that success is something you are either born into, or not. Joy is a film that has so much potential to inspire young women to be persistent and resilient in following their dreams, even when the odds are overwhelmingly against them, but by muddling Joy’s character development with the theme of destiny, it falls short of that potential, and leaves the viewer slightly dissatisfied.